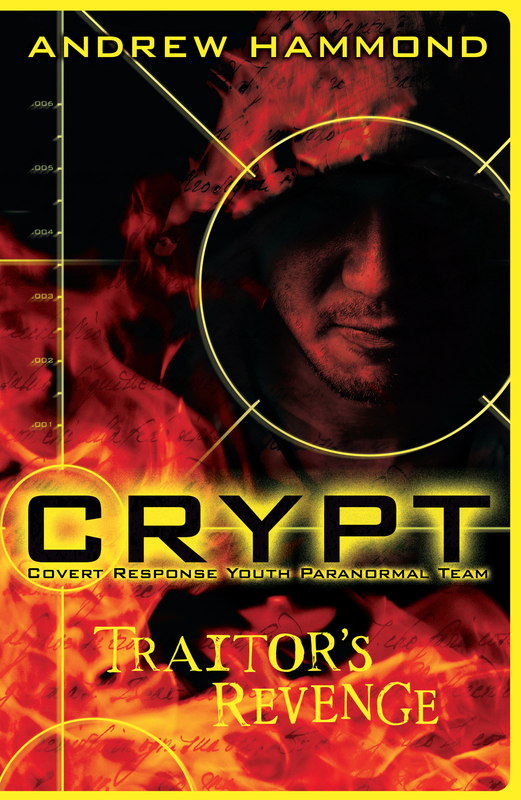 Andrew Hammond is the author of a seriously creepy new series called CRYPT (Covert Response Youth Paranormal Team). The series is about a group of teens who work in a secret government agency to protect the world from paranormal forces. It’s perfect for guys, especially any who like horror or authors like Darren Shan and Anthony Horowitz. Andrew’s latest book, CRYPT: Traitor’s Revenge has just been released in NZ so I caught up with Andrew to ask him a few questions about his books. 1. Did you write a history of the CRYPT organisation before you started writing The Gallows Curse? Yes, I did. It’s important when writing the first title in a series to ‘redefine the world’ containing CRYPT. Up until that point, there was no CRYPT and so it’s important to consider its history, its future and all the little inconsistencies in between. Readers are sharp these days – and they’ll spot mistakes if I haven’t considered how, why and when it all started. 2. Did you interview real ghost hunters when you were writing the CRYPT books? Although I have not spoken to a real ghost hunter, I read many books, magazines and blogs written by ghost hunters whilst preparing for this series. I’m keen to use the right equipment and the right terminology, so that it seems as real as possible. But the great thing about ghosts is that everyone has a different opinion about them – so that leaves lots of scope for writers like me. We know so little about what really makes up the universe – even at the atomic level – and so I am open to the possibilities of ghosts. Why wouldn’t anyone be? Without proof they don’t exist, it seems strange not to believe that they do. 3. Are the CRYPT gadgets based on real technology or did you create these? Yes, every piece of equipment issued to the CRYPT agents is real and available to purchase on line. It’s a well known fact that higher levels of electromagnetic energy are found in haunted places, so I’ve based much of the agents’ work in this area. Energy never dies – it remains as electro static and electro magnetic traces in the atmosphere and in the objects around us, and I believe it’s this energy that ghosts harness to take shape and return. 4. Which of the CRYPT gadgets is your favourite? It has to be the tri axis EMF detector – it’s faster and more accurate than other detectors at measuring the levels of electromagnetism in the air – often a sure sign that paranormal activity is occurring. 5. Have you witnessed any paranormal events yourself? Yes. I lived with a ghost for years in a big old Victorian house in Yorkshire, England. We often used to detect strange smells in the house, always around dinner time – the smells of fried onions, herbs, spices, sometimes even roast dinners. But it was never when any of us were cooking. Weird. Eventually we found where the smells were coming from – a small cupboard on the first floor of the house. We opened the cupboard door and were swamped in the smells of something cooking. But there was nothing inside it. We decided to look at the old floor plans of the house, dating back to Victorian times. Then we understood. The cupboard was a recent addition – before it was added there was once a small, spiral staircase which led directly down to the kitchen. That is precisely where the smells of dinner would gently waft into the house every evening in Victorian times. 6. What movies, books and music inspire you? I don’t watch scary movies or read many scary books – I’m just too easily frightened. I have a vivid imagination and just can’t sleep after something like that. But over the years I’ve found that being so sensitive can make you an effective writer – because I know what fear feels like. I can remember the sweaty palms, the prickly neck, the sinking feeling in my stomach and the palpations in my chest. I don’t wish to numb those senses – not just yet! Besides, I don’t want to be affected by other people’s notions of what horror could or should be. I like to come at this afresh. But as a kid, my favourite book was always Arthur Conan Doyle’s Hound of the Baskervilles. I’ve read it so many times now and one summer I even rented a cottage on the fringe of Dartmoor and read it on location. Scary stuff. 7. How many books do you plan to write in the CRYPT series? There are five books in the series. I’m working on Book 4 right now, which takes us back to Viking times – and some pretty ghastly rituals they carried out on their enemies. I like my history – always have done. I’m pleased to have the opportunity to write about real historical figures, events and places in each of my books. Recently, someone said of my CRYPT series: ‘This is great, history just got scary.’ I like that. Thanks to Andrew’s publisher, Hachette NZ we have copy of Gallow’s Curse and Traitor’s Revenge to give away. Enter my CRYPT competition to be in to win. Thanks for the interview. Very cool. Loved the first book and have got the 2nd by my bed waiting to be read. The maggots in the first one almost had me throwing up! Cool!